The guide books say Shwedagon Paya is visible from anywhere, and so you can use it as a landmark. It’s not, and you can’t. It was interesting how the taxi drivers had to say a little prayer everytime they passed the building, but not so great that they had to put their hands together and steer with their elbows! 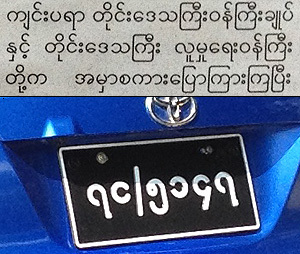 The guide books also say you can use US$ as well as Kyat. Things must have changed quite recently, as many fees are still quoted in US$ but everything is charged in the Kyat equivalent. I changed US$100 at the airport, and that was enough for four days of beer, food, entrance fees and taxis. (Note the priorities!) In fact I never used any US$. After buying a bottle of duty-free Myanmar wine, which turned out to be not quite as good as the Myanmar Beer, I had just Kys100 left. And that’s worth about 12 US cents, so I’ll keep it as a souvenir. Burma is still a cheap place, but not as cheap as guide books would have you believe. On the subject of money, the US$ bills you plan on changing to Kyats must be in perfect condition. The money changers literally inspect every bill with a magnifying glass. I was talking with one tourist who’d had a stack of US$100 bills held together with a paper clip. As he removed the clip it left a tiny nick in the top of the uppermost bill, and the bank refused to take it. Turn up with a pile of scruffy bills and you’re pretty-much screwed! Be prepared for the fact everything and everywhere has an entrance fee, usually small, but always higher for foreigners. And some places charge for camera use… mostly the places that have little worthy of being photographed. Every place you pay a fee you get a sticker on your shirt, and so if you do a lot of sightseeing, by the end of the day you end-up looking a lot like a rally car. Beef & fermented bean shoots. 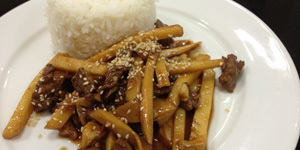 There are not as many restaurants as you’d expect, so plan where you might want eat. Shopping centers are the easiest and cheapest. Restaurants near to 5 star hotels can be pricy. Everyone wears flip-flops, all the time. It makes sense. It’s hot, and feet would be very sweaty in socks and shoes. But if you don’t regularly wear flip-flops your feet will suffer. It took a couple of days of extensive walking before my feet wore out! But after that, walking was painful, and bloody! And walking is by far the best way to see the place. I figure I covered about 12 – 15 kms a day. I tried to walk to the place I wanted to visit, and then grab a taxi back to the hotel. From a taxi I wouldn’t have seen the contrasts. 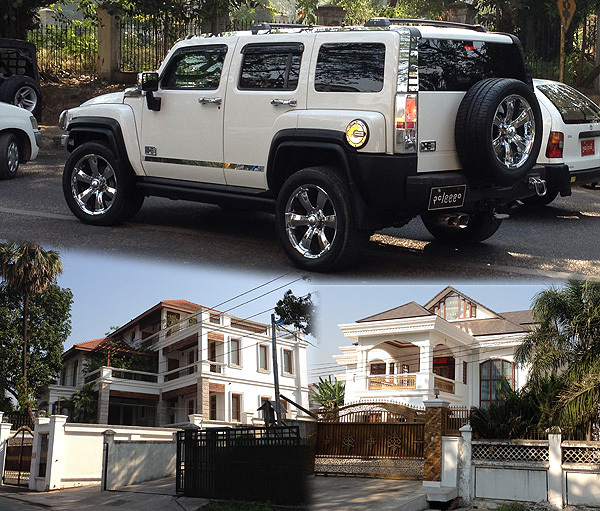 As I mentioned in another post, there are clearly some rich areas and wealthy people. 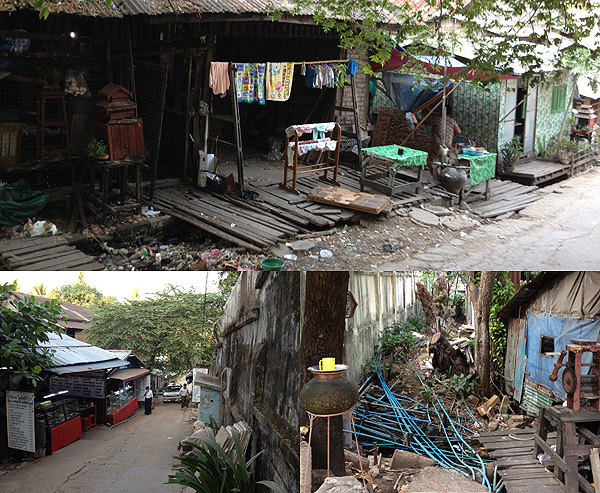 But sadly, there are some equally poor areas. Ahh. Really poor country izzit?! Well, I guess it depends where you look. 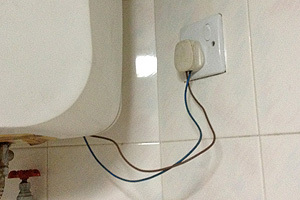 Not related to anything, here’s some super-safe wiring complete with ground wire, in my hotel bathroom. Well, maybe not super-safe, but coming soon? I want a license plate like that. And on that note, I’ll start planning the next adventure.